WHEN: February 1st 2014, doors open 6 p.m., draw starts at 7:30. PAYMENT OPTIONS: Cash or cheque made out to UBCSUO (UBC Students’ Union Okanagan) with memo stating Visual Arts. Please bring payment to Creative and Critical Studies building, Room CCS 153. The Kelowna Art Gallery is also selling tickets, cheques only. 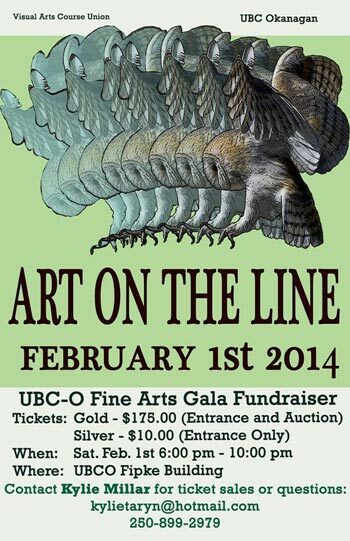 The Visual Arts Course Union and the Faculty of Creative and Critical Studies at UBC’s Okanagan campus will hold the 12th annual Art on the Line gala fundraiser on Saturday, February 1, 2014. This annual gala is one of the most widely popular visual arts events in our community. The art selection includes drawings, paintings, prints, photographs, sculptures, and mixed media in a variety of styles to meet all tastes and interests. Ticket-holders will select artworks based on the order of a random draw. The process continues until all 100 tickets are drawn. There will be approximately 120 pieces of artwork to choose from, so every ticket-holder gets a choice of juried artwork. Funds raised support the fourth-year visual arts students’ graduate exhibition and other events planned by the Visual Arts Course Union. Art on the Line will also donate 10 per cent of proceeds to Inn From the Cold, a local charity organization ( www.innfromthecoldkelowna.org/) .